Create a gaming zone like no other with the Arena computer desk from Arozzi. 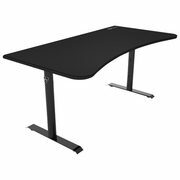 This roomy desk offers room for 3 large monitors and is deep enough to give you a huge field of for your mouse, keyboard, and other devices. The surface is covered entirely by a microfibre mousepad that has 5mm thick edges for comfortable use.